Antique cars and classic cars collecting, restoring, and showing have become the number one pass time for many classic car enthusiasts. Whether you’re new to antique cars as a hobby, or a seasoned collector, the internet has information on classic cars, car parts, accessories, car shows and antique car sales, and more. The first antique automobile was made in 1672 by a Chinese monk, and was steam powered. Then, around 1769, The Cugnot Steam Trolley was capable of transporting humans was produced. Other steam engine cars followed. By today’s standards, the steam car would be considered a green alternative to modern gas guzzlers. New hybrid cars still don’t operate on nothing but steam power like the steam trolley did over two hundred years ago. It wasn’t until 1806 that the first car with an internal combustible engine appeared. The internal combustible engine cars began to hook us all on vehicles that were powered with the use of gas and oil. In 1885, a more modern version of the internal combustible engine car was introduced. Even electric cars were designed very early in the twentieth century, but faded out in favor of gas powered vehicles. The Ford Museum, in Detroit, MI. still has a running, working model of Ford’s first electric motor on display. Antique Ford cars are highly collectible and well known in classic car circles. There are several eras of collectible automobile history. Each era has a specific term to define the particular types of classic cars made during those time frames. Knowing certain antique car terms can help you to decide which antique car era you want to focus on as an antique car collector or restorer. Classic cars from the 1890’s and earlier are termed “Veteran Era” antique autos. From around the 1900’s to 19190, those classic cars are generally referred to as the “Brass”, or “Edwardian” era collector cars. A very popular area for antique car collectors is the “Vintage” 1920’s era classics. Through the 1930’s to the 1950’s, there are “Pre-war” era classic cars. 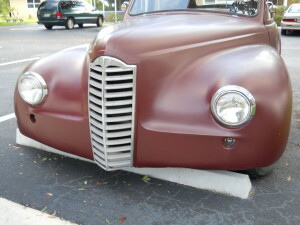 1950’s through 1970’s are termed: “Post-war” classic or antique cars. Cars that are twenty years old or older are generally referred to as “antique” cars. Another classic and collector car term you will hear is the term: “muscle cars”; which generally refer to sports cars made between the 1960’s to 1980’s. Whatever your classic antique car interest may be, the internet gives all the information, history, and antique car sales. Antique Car collecting and restoration is a hobby practiced by people all over the world. Even American celebrities fall in love with them. Jay Leno, in addition to hosting the Tonight Show, is known for his huge collection of antique cars and motorcycles going all the way back to the early 20th century. Past stars known for their love of cars are Larry Hagman and Steve McQueen.